So quite a few weeks ago I mentioned that I did a lovely little craft/art show here in Williamsburg. For it I made some last minute business cards. 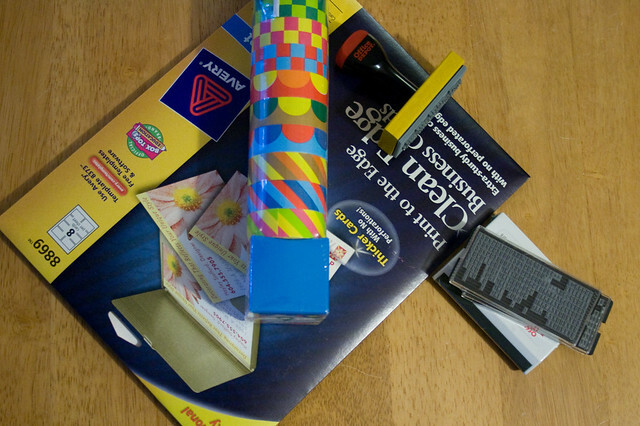 I thought this monday I'd show you how to make you own using the Kid Made Modern line at Target. I used the line of paper tapes (sort of like washi tape) but I also picked up some duct tape, because I couldn't resist! 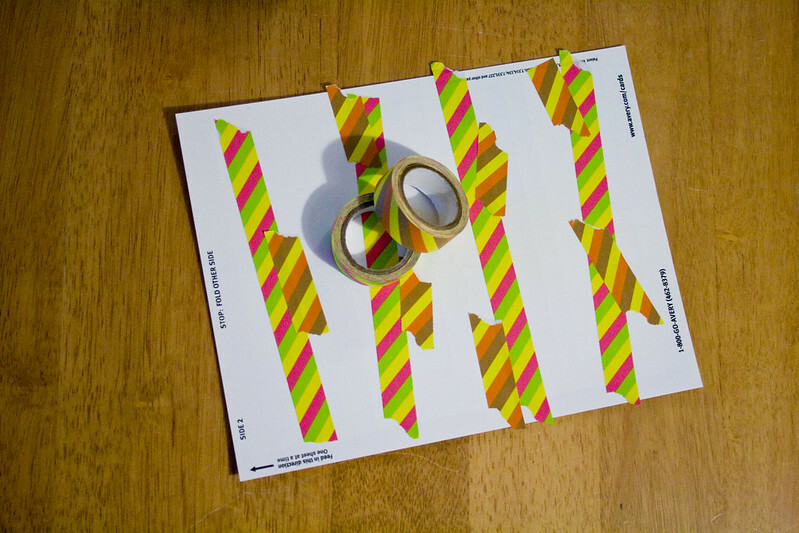 Instructions: I placed strips in assorted positions on assorted pages: vertical, horizontal, little strips, two strips, etc. I did this until I had quite a few sheets done. Make sure your tape isn't shiny otherwise the next step won't work. Stamp, Stamp, Stamp! Assemble your stamp with the letters you'd like to use. I used my name, etsy shop, blog, & email. Set each sheet aside so the ink will dry. Once you have quite a few sheets done, gently pop the business cards out of the page being extra careful when ripping the edges with the tape. Now you have a great stack of business cards! 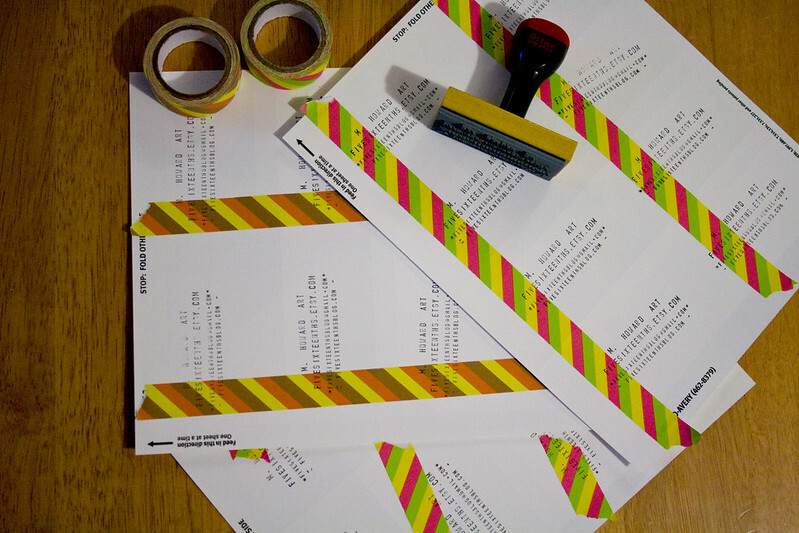 Make sure you stamp firmly & evenly, otherwise you'll end up with half your info missing. These business cards are great because they edges are clean, there aren't any perforations to make them look really cheap. Even though you can tell they are handmade, the crispness really adds to the design. This is a really adorable idea! Thanks! It was super easy & took only an hour or two. I hope you can try it! This is just what I was looking for. I need to make card for my business, but didn't see anything already made that would work. I have blank cards and cute tape at home. I'm going to try this when I get the chance. Thanks for the tip! 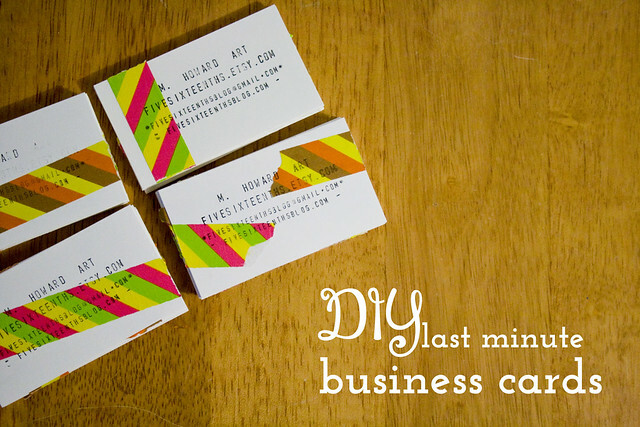 I'm always looking out for cool ways to make your own business cards. I think the hand made ones are better because it really reflects that person's style and it's so personal. Well that would be swell!! I am so glad you liked it! 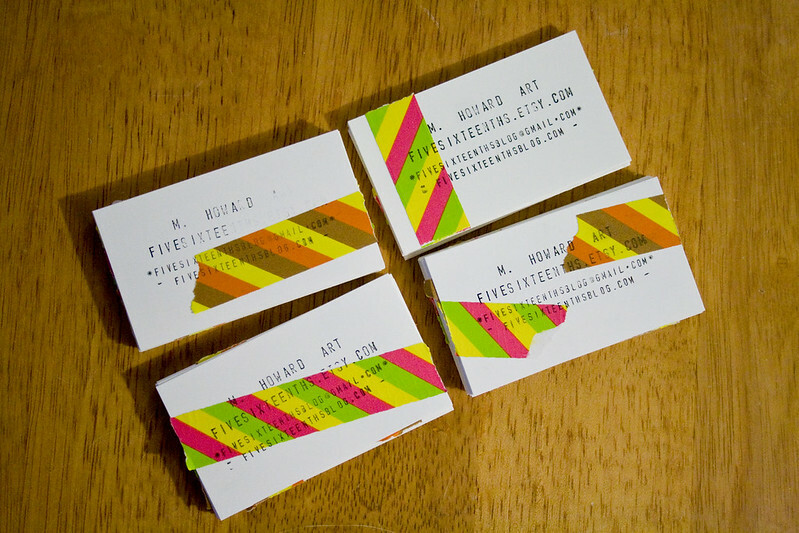 Hand made business cards add that extra 'hey I made this!' to your business! Besides continue power although, since seemed to be outlined, Plastic business cards there're extremely durable. Not simply usually are these people averse to in order to mineral water in addition to airborne debris, they're also ripping in addition to damage substantiation.